The girls appeared in court today. Two teenage girls have appeared in court charged with kidnapping a two-year-old with the intention of committing a sexual offence. The girls, aged 13 and 14 and from Tyneside, were also charged with shoplifting dummies, baby milk and a bottle. The little girl was taken from a Primark store in Newcastle's busy Northumberland Street on Wednesday afternoon. Once the alarm was raised, officers trawled through CCTV from the council, shops, Newcastle University, bus companies, the Metro and their own cameras. She was found an hour and 45 minutes later following a major search around three miles away in Gosforth Central Park in north Newcastle. 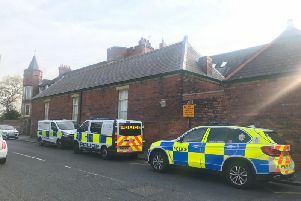 The girls, who cannot be identified, appeared before South East Northumberland Magistrates' Court, sitting as a youth court, for a hearing which lasted over 30 minutes. They are both charged with kidnap "with the intention of committing a relevant sexual offence" contrary to the Sexual Offences Act of 2003. They also face two counts of theft from a shop - dummies from Boots and the milk and bottle from a Sainsbury's, all said to have been of an unknown value. The alleged victim cannot be identified. The defendants were flanked by a male and a female security guard in the glass-fronted dock during the hearing. The girls, wearing grey tracksuits, appeared to listen closely to the proceedings. They spoke to quietly confirm their address and date of birth and to say they had understood the proceedings. They were denied bail and were ordered to be tagged and remanded into local authority care, to live and sleep at an address, from 7pm to 7am. No family members for the defendants or the alleged victim were in court. District Judge Roger Elsey told them: "You appreciate that you are charged with very serious offences. "I understand that you are not admitting these offences and you are not convicted of them." He told them they must not discuss the case on social media. The girls will appear before North Tyneside Youth Court on May 13. In the meantime they must not enter Newcastle city centre. Northumbria's Police & Crime Commissioner, Vera Baird QC, has today thanked police and partners for their help in finding the girl and reuniting her with her mother. She said: "None of us can imagine the distress the family and the toddler were going through. As Police & Crime Commissioner, I am proud of all our staff and partners who helped in the search." The toddler was found in just over an hour afer being reported to the police. Mrs Baird added: "Partnership working has proven so effective - the police, retail staff, council employees and the transport network, Newcastle University and Nexus have delivered. Northumbria Police coordinated this operation quickly and effectively and enabled the toddler to be quickly tracked down and reunited with her mam."